The Boeing Company BA recently won a modification contract involving its F/A-18 fleet of jets. The contract was awarded by the Naval Air Systems Command, Patuxent River, MD. Valued at $4 billion, the contract is expected to be completed by April 2024. Per the terms of the deal, the aerospace giant will conduct full-rate production and delivery of 78 F/A-18 aircraft, specifically 61 F/A-18E and 17 F/A-18F aircraft for fiscal years 2018 through 2021. The majority of the work will be executed in El Segundo, CA. Boeing’s F/A-18 Block III Super Hornet is a twin-engine, supersonic, all weather multirole fighter jet. Notably, it comes in two versions — the single-seat E model and the twin-seat F model. The company is continuously upgrading the Super Hornet program to outpace future threats. Also, Super Hornet’s radar, mission computers and sensors continue to evolve in order to meet extensive mission profiles. Due to rising worldwide demand for military aircraft, Boeing has developed the Advanced Block III Super Hornet. This fighter jet will complement existing and future air-wing capabilities, which include battle-space situational awareness, counter stealth targeting, increased acceleration and improved survivability. As a result, Boeing is witnessing strong demand for its fighter aircraft and major aerospace programs, including the F-18 aircraft, given the current geopolitical tensions worldwide. Boeing, one of the major players in the defense business, has broadly diversified programs, strong order bookings and solid backlog. Furthermore, the company’s expertise lies in programs related to a wide variety of aircraft components, repairs and modification work. Boeing’s combat-proven aerospace programs and associated services and the growing need for military aircraft have led to solid inflow of orders from Pentagon. These contract wins, in turn, boost top-line growth of the company’s defense business. In fourth-quarter 2018, revenues at the Boeing Defense, Space & Security (BDS) segment, which manufactures military jets like F/A-18, EA-18 Growler and its related components, increased 16% year over year to $6.11 billion. We expect the latest contract win to help the unit deliver similar top-line performance going ahead. Meanwhile, the fiscal 2019 defense budget has provisioned aircraft investments worth $21.7 billion for war fighting. Boeing, being the largest aircraft manufacturer in the United States, is expected to be a significant beneficiary from the budget, which includes an investment plan of $2 billion for procuring 24 F/A-18E/F aircraft. Such inclusions reflect solid growth prospects for the BDS segment and in turn Boeing. 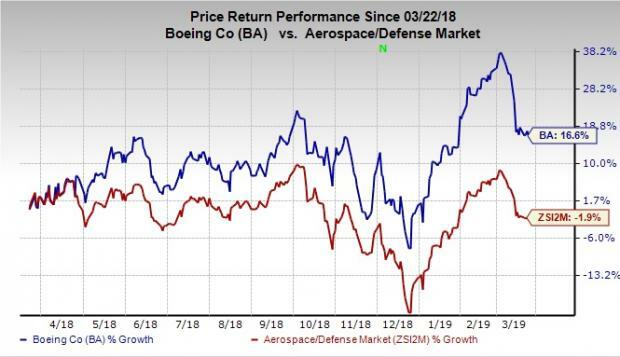 Boeing’s stock has gained 16.6% in the past 12 months against the industry’s decrease of 1.9%. The outperformance was primarily led by robust worldwide demand for its commercial aircraft and military jets. Spirit Aerosystems’ long-term earnings growth rate is projected to be 7.80%. The Zacks Consensus Estimate for 2019 earnings has moved 3.7% north to $7.56 over the past 90 days. HEICO’s long-term earnings growth rate is projected to be 12.10%. The Zacks Consensus Estimate for 2019 earnings has moved up 7% to $2.14 over the past 90 days.